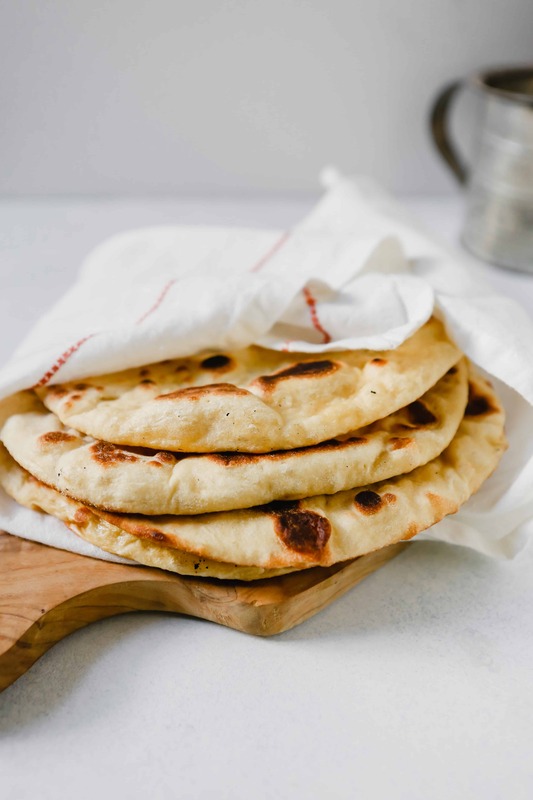 This authentic homemade naan bread recipe makes use of a hot cast-iron skillet, not a tandoori oven, and just 6 ingredients that you probably already have on hand. It’s airy, yet chewy and has just a bit of crunch that creates the most addictive bread. I love naan bread, but brush it with a little bit of my honey-garlic butter and watch out. This bread quickly goes from delicious to I-can’t-stop-eating-it. Seriously. What to serve naan with? 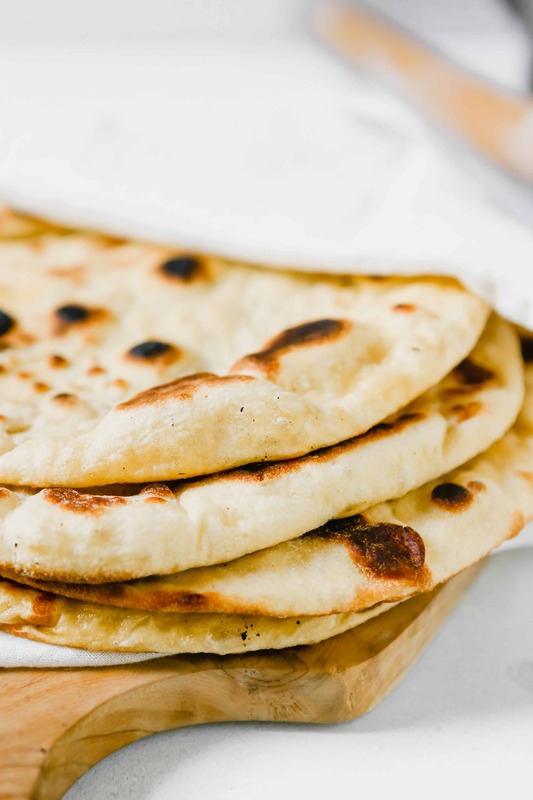 Freshly cooked naan is wonderful with Chana Masala, Chicken Tikka Masala, Butter Chicken, and all kinds of soups or stews, especially curries. 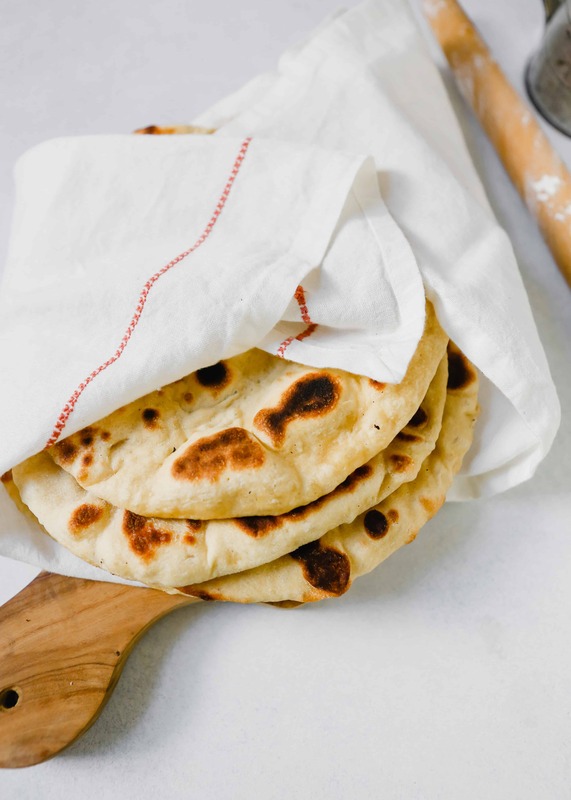 Is homemade naan easy to make? Very! 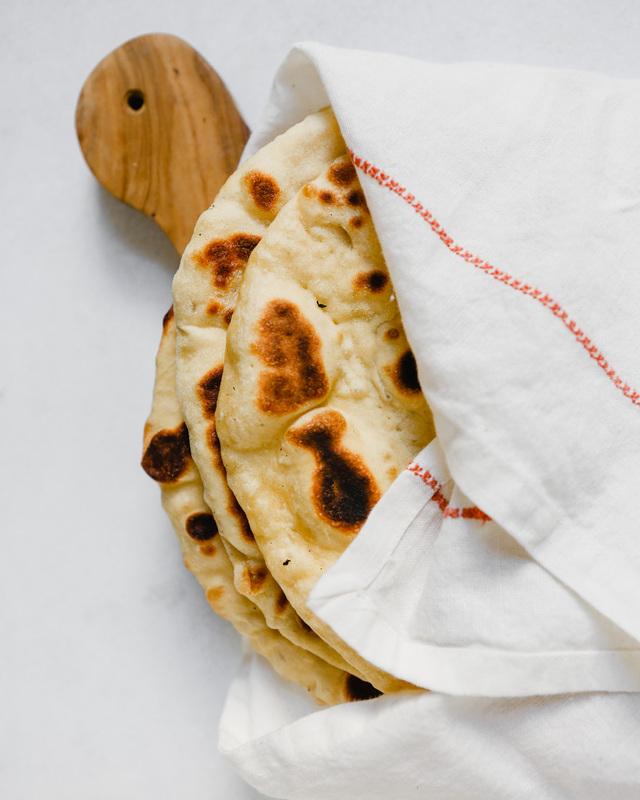 Making naan at home is a cinch. The biggest things to keep in mind are making sure your yeast is fresh (don’t want to use expired stuff or your dough won’t rise) and having a bit of patience. The process of making naan is inherently simple, you’ve just got to be patient with the rising process. 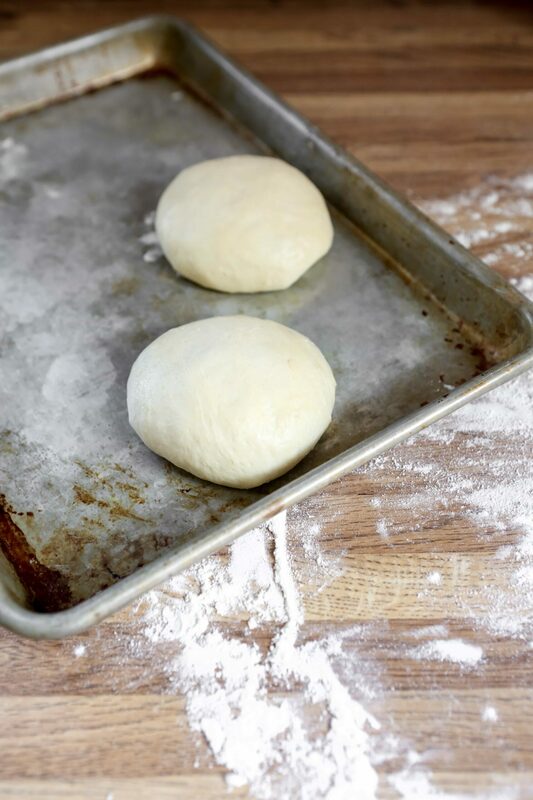 If you aren’t into the three separate 30-minute rises, you can prep the dough a day in advance and do a slow rise in the refrigerator, so simple and so hands-off! You can find make ahead instructions in the notes section of the recipe card. Naan isn’t unhealthy, but I also wouldn’t say it’s overly wholesome. This recipe does make use of healthy fats from Greek yogurt, olive oil, and egg yolk. However, traditional naan uses all-purpose flour which doesn’t bring much of anything to the table other than carbs. Finish it with a few brushes of melted butter or my addictive honey-garlic butter and you’ll really gild the lily. Maybe not the healthiest part of your day, but will definitely be the most delicious. I choose to live a little. Traditionally, no. Naan is not gluten-free. I haven’t tested this naan bread recipe with gluten-free flour mostly because I wanted to create an authentic naan bread recipe. However, I do plan to test this down the road with a gluten-free flour blend, as well as few different flours such as whole-wheat and buckwheat. Would you like to see alternative naan bread recipes? Tandoori refers to a type of Indian cooking that utilizes a tandoor oven. A tandoor oven is most often made of clay with mud or concrete packed around the external sides as insulation. Circular in shape, tandoor ovens often resemble a bottle, slightly tapering at the top to concentrate heat. To prepare a tandoori oven, a fire is started at the base then allowed to die down before cooking. Letting the fire die down and relying on the hot coals ensures an even cooking temperature for hours. Naan is often cooked in tandoor ovens by slapping the dough against the sides of the clay oven. Long skewers of marinated meats are also cooked in tandoor ovens. 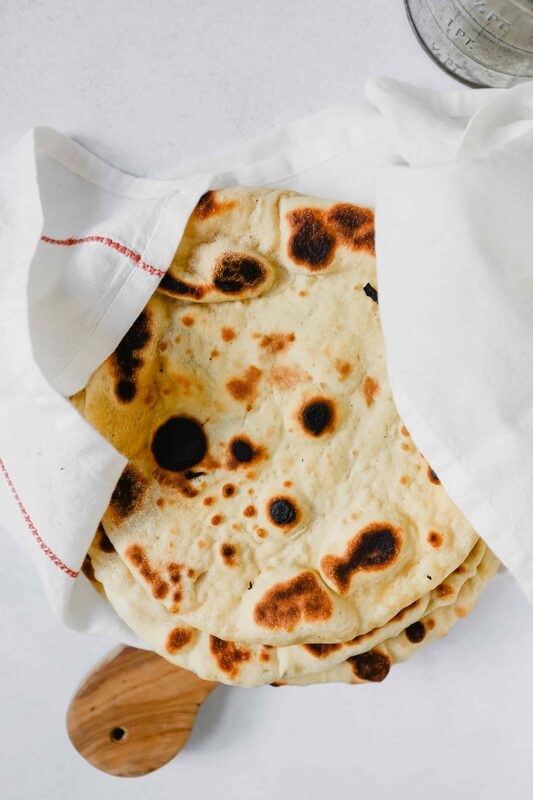 Make homemade naan bread today with this authentic, yet simple recipe that uses a cast-iron skillet—no tandoori oven required. Just 6 ingredients is all you need! 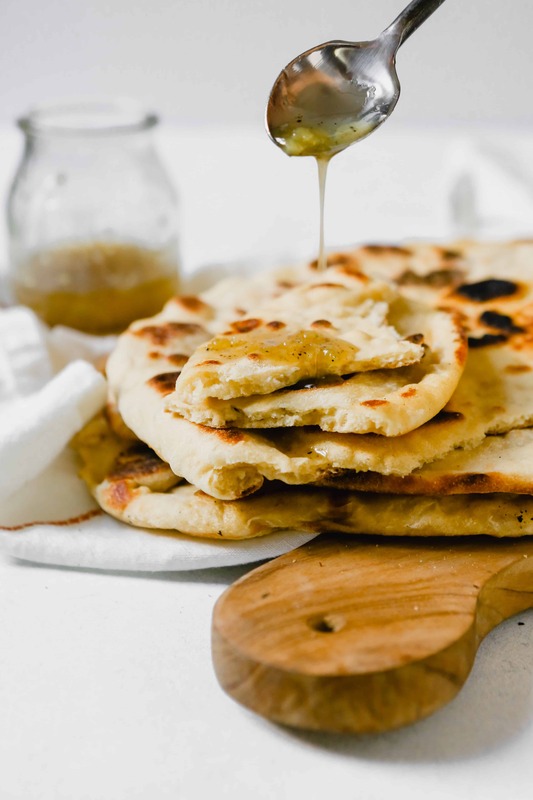 The brush the warm naan with a super simple honey-garlic butter for even more flavor. For the naan, combine water, yogurt, oil, yolk, and honey in a liquid measuring cup or bowl. Process flour and yeast in a food processor to combine. With processor running, slowly stream in water mixture until just combined and no dry flour remains, about 10 seconds. Let dough rest 10 minutes. Add salt to dough and process until a satiny, sticky dough ball forms and clears the sides of the bowl, about 60 seconds. Transfer dough to a lightly flour surface and knead until smooth, 1 minute. Shape dough into a tight ball and place in a large, lightly oiled bowl. Cover tightly with plastic wrap and let rise at room temperature 30 minutes. 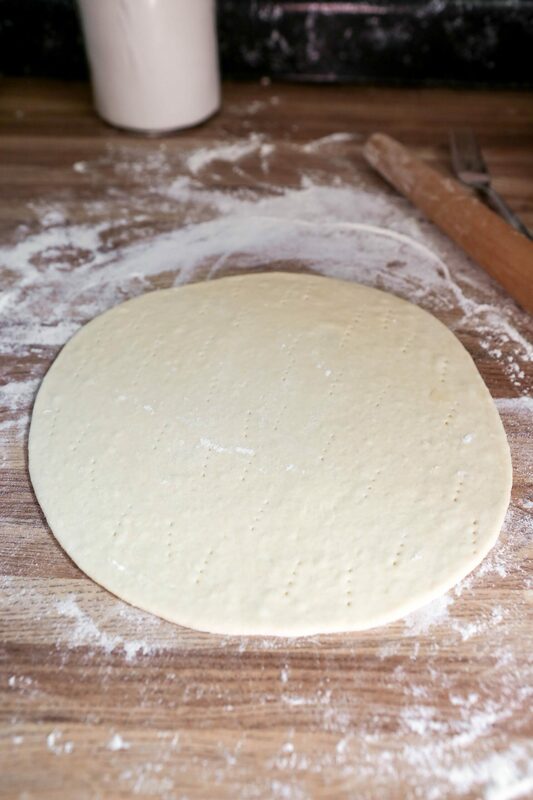 After 30 minutes, fold partially risen dough over itself 8 times by gently lifting and folding edge of dough toward middle, rotating bowl 90-degrees after each fold. Cover with plastic wrap and let rise 30 minutes more. Repeat folding, then cover tightly and let rise one last time for 30 minutes. Transfer dough to a lightly floured surface and divide into 4 equal pieces. Shape each piece into a smooth, tight ball and transfer to a lightly oiled baking sheet, spacing two inches apart. Cover loosely with lightly oiled plastic wrap and let rise 20 minutes. Preheat oven to 200°F with a baking sheet set inside. Transfer 1 ball to lightly floured surface and sprinkle with flour. 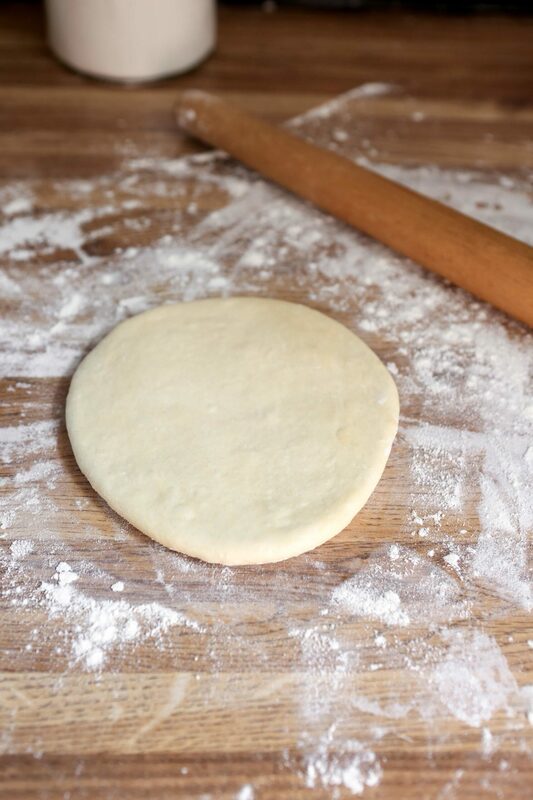 Roll piece of dough into an 8–8½-inch round of even thickness, sprinkling with more flour as needed. Using a fork, poke entire surface of round 30 times. Heat 1 teaspoon oil in a cast-iron skillet over medium until shimmering, wipe oil out of skillet with paper towels. Mist top of dough with water, then transfer to skillet, moist-side down; mist top surface of dough with water and cover. Cook dough until bottom is brown in spots across surface, about 2 minutes. Flip naan, cover and cook until golden brown in spots across surface, about 2 minutes. Transfer naan to baking sheet in oven to keep warm. Repeat rolling and cooking with 1 more dough ball. 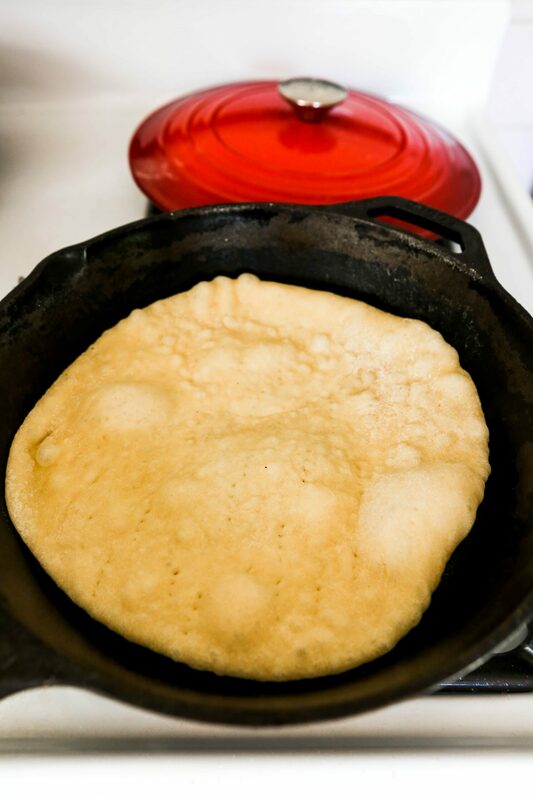 Add last teaspoon of oil to cast-iron skillet, wipe out oil, then repeat rolling and cooking remaining 2 dough balls. 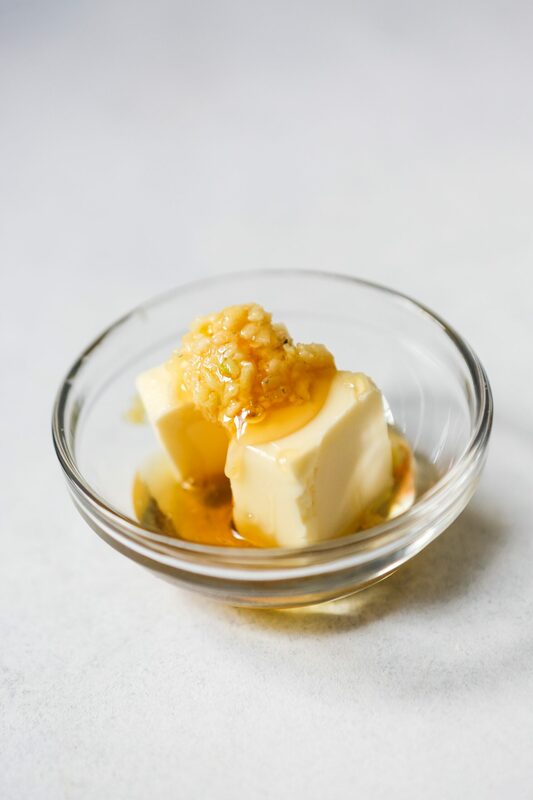 For the honey-garlic butter, combine butter, honey, and garlic in a small microwave-safe bowl. Microwave 30–45 seconds on high until butter is melted; whisk to combine then season with salt and pepper. Brush butter mixture over top of cooked naan and serve. Don’t want to make this recipe all in one day? You can prep the dough 1 day ahead and let it slow rise overnight. Follow recipe through kneading and placing in large oiled bowl. Cover tightly with plastic wrap and refrigerate for 16–24 hours. Then follow recipe instructions beginning with forming into four equal dough balls.